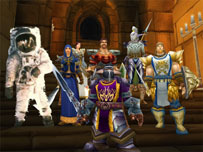 NASA has put out its feelers as it searches for parties interested in developing an MMO that simulates space missions. The proposed MMO would be targeted at students who could become the next generation of astronauts, the BBC reports. A "request for information" (RFI) reads, "A high quality synthetic gaming environment is a vital element of NASA's educational cyberstructure. "The MMO will foster career exploration opportunities in a much deeper way than reading alone would permit and at a fraction of the time and cost of an internship program." NASA is giving interested parties until February 15 to respond to the request. As opposed to a typical commercial product, any potential NASA MMO would also be used as an educational and recruitment tool, rather than solely a piece of entertainment. "Virtual worlds with scientifically accurate simulations could permit learners to tinker with chemical reactions in living cells, practice operating and repairing expensive equipment, and experience microgravity," NASA said.